The Lions did it again. The West Linn girls basketball team won its way into the Class 6A state tournament for a second straight season on Saturday, beating Central Catholic 50-40 in the second round of the state playoffs at West Linn High School. In the process, the Lions tied their school's record for consecutive big-school state tournament appearances, matching the success of the West Linn teams that reached the tournament in both 1984 and '85 (the '85 Lions finished second at state). The 2018 West Linn team played its way to third place a year ago. "It feels amazing," said sophomore guard Payton Shelstad, who scored 10 points in her team's victory. "We are such a young team and so many people doubted us, but we really just fought to the end and kept trying." "Everyone thought we would go into a slump after we lost our four amazing seniors, but we came back this year and changed everyone's minds," said West Linn sophomore post Aaronette Vonleh, who led her team Saturday night with 15 points. "This is a huge deal for us," added West Linn junior Elisabeth Dombrow, who finished with nine points against the Rams. "This is the second year in a row that West Linn is going and I couldn't be more thankful for this group of girls. This means so much." With the win — the team's fourth straight — the fourth-ranked Lions improved to 19-6 overall and secured a berth in the state quarterfinals. West Linn, which tied for second place in the Three Rivers League season, will open state tournament play against No. 5 Beaverton (17-11 overall) at 3:15 p.m. Thursday at the Chiles Center on the University of Portland campus. No. 20 Central Catholic, meanwhile, saw its four-game winning streak snapped and ended its year at 17-9 overall after winning the Mt. Hood Conference championship. Vonleh helped the Lions get off to a running start on Saturday, scoring just 18 seconds into the game off a Dombrow assist and collecting nine of her 15 points in the opening frame. Vonleh hit 4 of 6 shots from the field, blocked a shot and grabbed two rebounds in the period, but Central Catholic stuck with the Lions. Rams junior Marianna Payne kept her team close by scoring five in the first quarter — including 3 of 5 free throws — while senior teammate Bella Scarlett hit a 3-pointer to keep Central Catholic within 13-10. The Rams then cut West Linn's lead to 17-16 when junior Abby Cooper drilled a "3" from the top of the key with 5 minutes, 37 seconds remaining in the second period, but the Lions pulled out to a 31-23 halftime lead thanks to seven points in the quarter from Shelstad (including two 3-pointers), six from junior post Vanessa Viuhkola and five (including a "3") from Dombrow. "In the second quarter, we just played loose and played our game and it helped us a lot," Viuhkola said. The Lions kept rolling in the third quarter, too, building their biggest lead of the game at 44-27 when Dombrow scored on a drive with 1:45 left in the stanza. 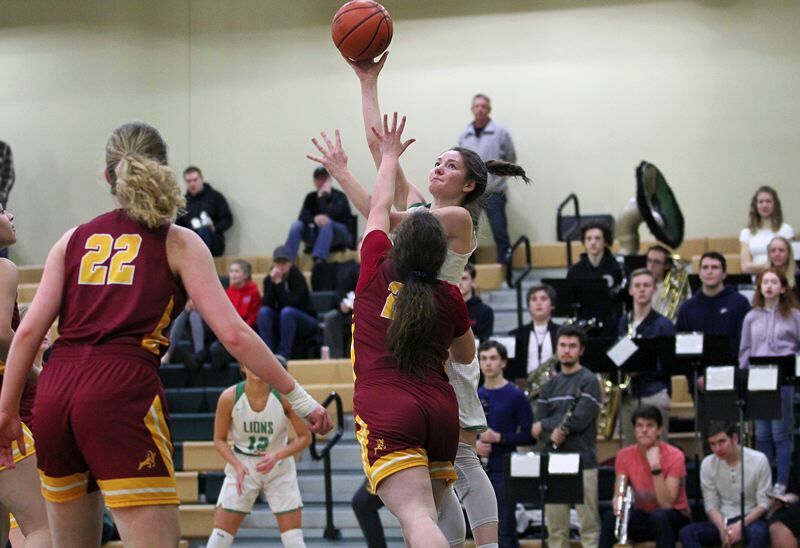 Lion sophomore Audrey Roden came through with five of her seven points in the quarter, and at the same time, West Linn held the Rams to just 3 of 14 shooting from the field. The Lions still led 48-32 when Vonleh took a Dombrow pass and scored from the left block with 3:28 left in the game, and while the Rams eventually cut their deficit down to 10 points, it didn't happen until Payne knocked down a "3" in the game's final 32 seconds. "They are a really good team. They really should be ranked higher than 20 in our opinion," Shelstad said. "But once we got going … we just kept on going." "We were so shocked that they were ranked number 20. They're a heck of a good team," Dombrow added. "We were nervous to play them, but we got them." For the game, Vonleh hit 6 of 10 shots from the field and 3 of 3 free throws, along with eight rebounds and four blocks. Shelstad hit 3 of 6 shots from the field (including one "3") and 2 of 4 foul shots, along with four rebounds and two steals. Dombrow hit 4 of 6 shots from the field (including one 3-pointer) and added five assists and five rebounds. Roden had a tough shooting night (3 of 11 with one "3" and 2 of 3 foul shots), but grabbed nine rebounds and added two assists and two steals. For Central Catholic, Payne led all scorers with 18 points after making 4 of 12 shots from the field (with one "3") and 6 of 10 free throws, along with 10 rebounds, two blocks and two steals. Claire Bass and Scarlett added seven points apiece for the Rams.